Until August, Martin attended school just for two hours per weekday. His new school runs more than five hours per weekday, with a decent commute on either end, to boot. Participating in CPSE also carries family responsibilities. We can’t willy-nilly yank Martin out of school, or decide that he’ll skip a day. As a result, we now concentrate doctor visits and private therapies, when possible, on the weekends. We try to make family fun out of shuttling from one appointment to the next. Today Martin woke around 7:45 a.m. (an extra 45 minutes’ sleep from school days). He and Adrian completed some RDI exercises while I assembled their weekend breakfast. Martin got squash “French fries” with kelp flakes and one duck egg fried in hemp oil with minced cilantro. Adrian got the same, but substituting a chicken egg and adding a slice of whole-wheat toast. It was a lazy morning, and despite the early start we managed to leave late for our 10:30 a.m. meeting with Dr. Ingels, the allergist, near Union Square. Because we were setting out for the day, we took the car, which of course made us even later, our route blocked by firemen using their truck and ladder to remove their stationhouse’s window-unit air conditioners, and then by a moving crew marching across 23rd Street with mattresses. A bunch of mattresses. Dr. Ingels pardoned the untimely arrival, and we enjoyed a routine visit. Martin’s tolerance for malverine, piperine, and candida has increased. From Dr. Ingels’s we headed north, to Pleasantville, for a 12:30 p.m. session with Martin’s HANDLE therapist, Katie. She is the chief proponent of accomplishing Martin’s recovery as gently as possible. We discussed ways to soften the process even more. I talked about Martin’s attention and language lagging this past month. Katie asked about Martin’s sleeping and body control, which actually (I realized) have during the same period been quite good. Attention and language are advanced functions, she reminded me. Sleep and control are building blocks. We grabbed lunch at the Pony Express in Pleasantville and ate in the plaza by the train station. Martin had rice crackers and homemade white-bean hummus. He investigated some trees, ran to the fence to watch a train pass below, peered with interest at (but did not speak to) another little boy. Overall, he seemed better. I’m beginning so sense a return of his attention, since we reduced the Biosode from 1x dilution to 2x. From there we moved on, even further north, to the highlight of the day (for Martin, and perhaps Adrian) and an onerous task (for me). We drove to Hemlock Hill Farm in Cortlandt. We had researched farms on the internet in search of one that was organic and came close to meeting my ethical standards. We need some meat. Yes. Meat. We’ve decided to feed Martin limited amounts of meet, and see if it augments his recovery. The choice has been weighing heavily on me these two weeks or so, and I needed to have it over with. So off we went to Hemlock Hill Farm. 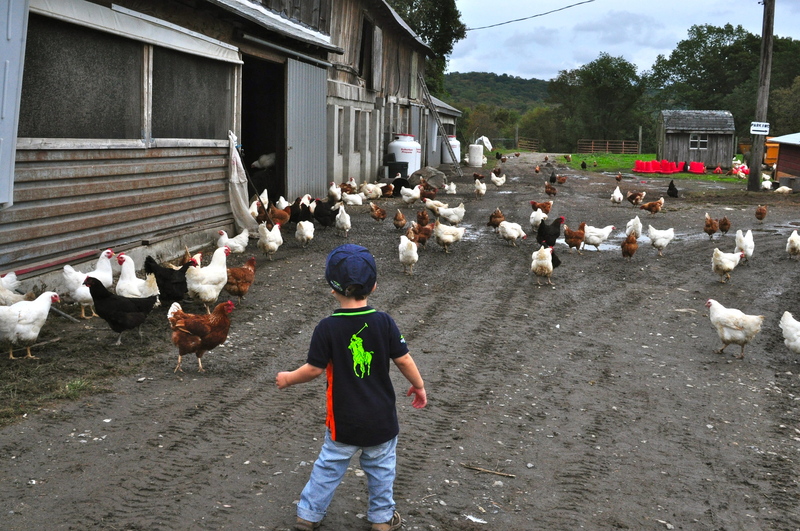 Adrian took Martin to wander among the chickens and geese. I entered the little shop the farm maintains, more or less a concrete room with refrigerated glass display counter, freezer, shelving unit, and a few display bins. A man behind the counter asked if he could help me. I decided honesty would be the best approach and ’fessed up that I had no idea what kind of meat. I’m a vegetarian, I explained. My son has a medical condition, and I’m going to try preparing him some meat. The fellow was friendly and patient. He showed me packaged goat parts and which beef cuts have bone in them. (I’m supposed to put bone in the crockpot for making broth.) He explained how I could differentiate meat of animals killed on-site from that of animals killed at a USDA-certified facility in Pennsylvania. (I didn’t want any flesh from animals who were transported before slaughter. Too cruel.) 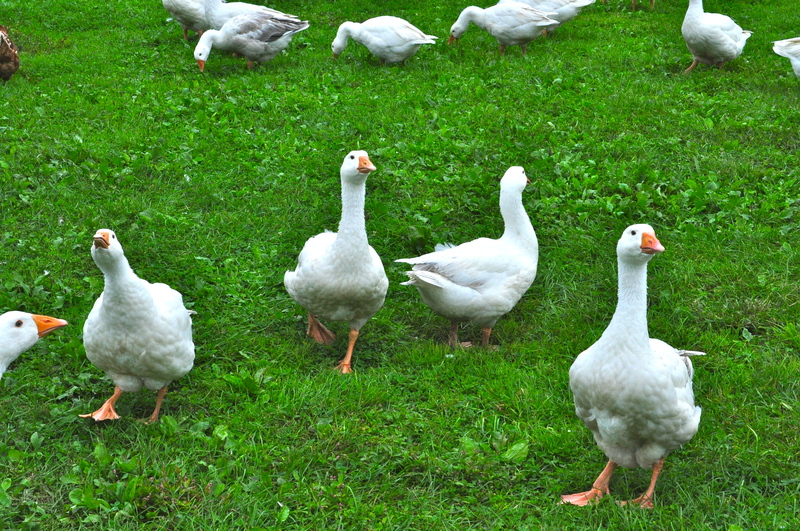 I read information on what the animals eat—primarily, grass and grain also produced in Westchester County, at another farm. I asked about quail eggs. The farm has had them in the past but did not have any now. Finally I purchased two frozen shank cuts, bone in. Cow meat. I took a dozen duck eggs, too, saving myself a trip to the farmer’s market. Then I went out to greet the animals. The ones still alive, anyway. The birds seemed happy and unafraid. Other than wire fences delineating the fields—ducks over there, chicken and geese this way—they have freedom to move about as they please and peck at the ground. The recent rains had left the area muddy, but I could imagine some serious dust bathing when our prodigal sun reemerges. The cows were grazing in a pasture some distance up the road, so I declined the farmer’s invitation to go meet them. She also invited me to hang around until the cows came home from pasture around 5:30 p.m. The day had already stretched long, however, and we needed to be getting back to the City. Martin knocked off early this evening, exhausted from new HANDLE exercises and playing amongst the fowl. My mind remains fixated on the cow meat now in my freezer. Tomorrow evening I will try to make a beef broth. I hope that I don’t fail and waste the flesh. This new chapter will be complicated. This entry was posted in Diet, Food, HANDLE by findingmykid. Bookmark the permalink. I’m sure you have some recipes, but making beef broth is not too different from making vegetable broth, except you’ll want to do a slow simmer for many hours. Actually, best is to put it in a slow cooker and leave it overnight. Otherwise, once it goes to boil, set it on the lowest setting possible and just let it all simmer. Besides the shanks, throw in some vegetables like you would for a vegetable stock. Oh, I forgot to mention, unlike vegetable broth, you won’t be able to eat the vegetables after the broth is made–they will be too mushy–just just throw them in big hunks and strain them out along with the bones. BTW, I don’t know if they cut the shanks to open the bones but it’s best if they do so that all the collagen in the bone and cartilage melt into the broth. A good beef broth, when refrigerated, will become like jelly due to all the collagen.